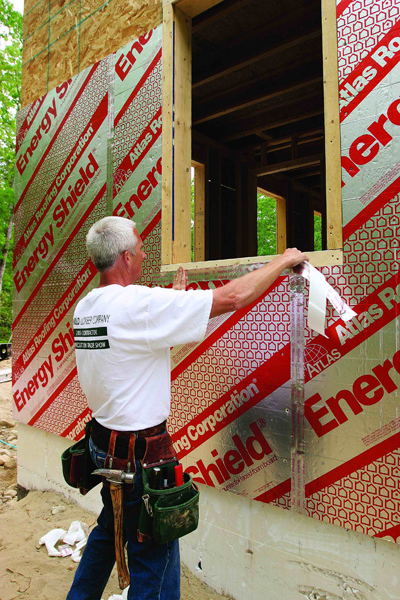 Cold-climate builders: get ready for mandatory foam sheathing. The 2012 International codes will require new homes in cold climates to have exterior foam sheathing, or some similar layer of continuous insulation that interrupts thermal bridging through studs. Image Credit: Fine Homebuilding Table 402.1.1 from the 2012 IECC shows prescriptive requirements for window U-factors, window SHGC, ceiling R-values, wall R-values, basement wall R-values, and crawl space wall R-values. Image Credit: ICC This table prepared by the Energy Efficient Codes Coalition shows some of the 2012 IECC insulation requirements, with changes from the 2009 code highlighted in green. Image Credit: Energy Efficient Codes Coalition This table prepared by the Energy Efficient Codes Coalition shows the 2012 IECC requirements for window U-factors and SHGC, with changes from the 2009 code highlighted in green. Image Credit: Energy Efficient Codes Coalition This table prepared by the Energy Efficient Codes Coalition compares the 2012 IECC duct leakage limits with earlier limits in the 2009 IECC. Image Credit: Energy Efficient Codes Coalition This table prepared by the Building Energy Codes Resource Center shows the efficiency requirements for so-called high-efficacy lamps. 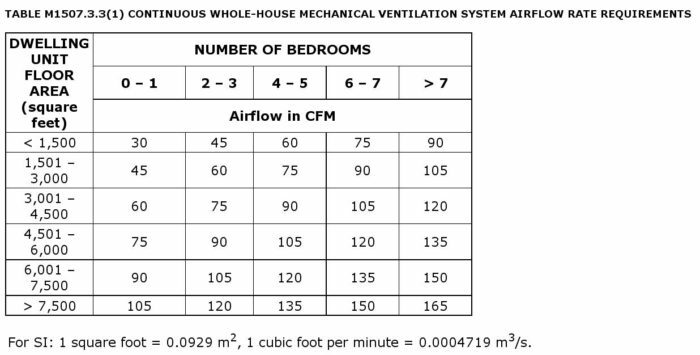 Image Credit: Building Energy Codes Resource Center Table M1507.3.3(1) from the 2012 IRC shows the minimum air flow rates required for a whole-house ventilation system. Image Credit: ICC Table M1507.3.3(2) from the 2012 IRC provides information on intermittently operated whole-house ventilation systems. Are you ready for the 2012 code? Each revision of the International codes tends to ratchet up energy performance requirements, and the 2012 revision is no exception. Although its adoption may be a long ways off in some jurisdictions — after all, many rural areas of the U.S. still have no building codes at all — the 2012 International codes may become law in some areas as soon as next year. The 2012 code requires more insulation, a tighter envelope, tighter ducts, better windows, and more efficient lighting than the 2009 code. While the 2009 codes required that 50% of lighting fixtures in a new home to be so-called “high-efficacy” fixtures (fixtures using a CFLs or equivalent), the percentage has been raised to 75% in the new code. Blower-door testing requirements have become mandatory and more stringent; the 2009 threshold of 7 ach50 has been changed to 5 ach50 for climate zones 1 and 2, and 3 ach50 for homes in all other zones. All homes in zones 3 through 8, and some homes in zones 1 and 2, will be required to have a whole-house mechanical ventilation system. In many climate zones, window glazing U-factor and solar heat gain coefficient (SHGC) requirements have been changed. Wall insulation requirements have become more stringent in climate zones 3, 4, 6, 7, and 8; for the first time, builders in climate zones 6, 7, and 8 will be required to install exterior rigid foam insulation (or to use some other comparable wall insulation strategy). The bottom line: every new home will need to be tested with a blower door, every cold-climate builder will need to come up with a strategy to stop thermal bridging through studs. The 2012 IRC still includes energy efficiency requirements in Chapter 11. However, these requirements are now identical to the residential provisions found in the 2012 IECC. In essence, chapter 11 of the IRC is just a reprint of the applicable sections of the 2012 IECC. Until the most recent round of code revisions, residential builders could choose to comply with one of two energy codes: either Chapter 11 in the IRC (the “Energy Efficiency” chapter), or the residential section of the IECC. Most builders found it easier to follow the IRC. However, any builder who wanted to follow the performance path (rather than the prescriptive or component-tradeoff path) had to use the IECC, since the IRC didn’t include a performance path option. The fact that there were two parallel energy codes — one in the IRC, and one in the IECC — was confusing to many builders. While the two codes were aligned on most matters, they occasionally conflicted, further adding to confusion. The 2012 code revisions have simplified the situation. Now that the IRC now simply references the requirements of the IECC, residential builders have only one option. If you are willing to endure the limitations of a quirky website, you can download several versions of the IRC as well as several versions of the IECC — one paragraph at a time — from a website maintained by the International Codes Council. In section R404.1, the 2012 IECC requires that “a minimum of 75 percent of the lamps in permanently installed lighting fixtures shall be high-efficacy lamps.” The percentage has been raised from 50% in the 2009 code. 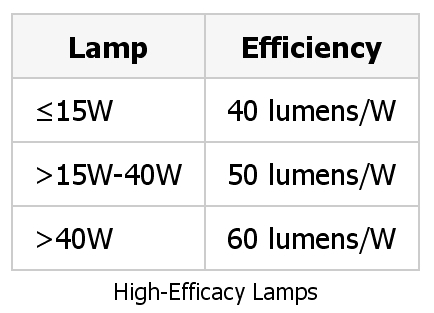 Any lamp meeting the following minimum efficiency requirements: 60 lumens per watt for lamps over 40 watts, 50 lumens per watt for lamps over 15 watts but no more than 40 watts, and 40 lumens per watt for lamps rated at 15 watts or less. This definition excludes incandescent light bulbs. High-efficacy lamps are allowed to have any type of base; screw-base (Edison-base) lamps comply with the new code. Like the 2009 codes, the 2012 IECC requires duct leakage testing unless the duct system is located entirely inside of the home’s thermal envelope. The new code has increased the stringency of the duct leakage thresholds. One option is a so-called “rough-in” test before the air hander is installed. While the 2009 code had a threshold of 4 cfm per 100 square feet of conditioned floor area for this test, the 2012 code has lowered this threshold to 3 cfm. Another option is a so-called “rough-in” test after the air handler is installed. While the 2009 code had a threshold of 6 cfm per 100 square feet of conditioned floor area for this test, the 2012 code has lowered this threshold to 4 cfm. The third option is a so-called “post-construction” test. While the 2009 code had a threshold of 12 cfm per 100 square feet of conditioned floor area for this test, the 2012 code has lowered this threshold to 4 cfm. The bottom line: get out your tub of mastic, and seal everything well. The 2009 International codes included provisions to improve the air tightness of new homes. Builders were given two compliance options: either follow a checklist of measures or have the home tested with a blower door. The new 2012 code doesn’t give builders a choice anymore; builders now have to comply with both the checklist requirements and the requirement to conduct a blower-door test. The air-sealing checklist in the 2012 IECC is called Table R402.4.1.1, “Air Barrier and Insulation Installation.” The 2012 table is based on the earlier checklist (2009 IECC, Table 402.4.2); however, the 2012 version is written in mandatory language, and a few ambiguities in the earlier table have been cleared up. Once you have completed the air-sealing checklist, you still need to conduct a blower-door test. It’s up to the local code official to determine whether builders can conduct their own tests or whether builders need to contract with a third-party tester. The code does not require third-party testers to have completed any type of certification or training in how to use a blower door. Although the 2012 IECC includes provisions to improve a home’s airtightness, it is silent on the question of whether new homes need mechanical ventilation systems. However, the 2012 IRC does include requirements for mechanical ventilation. 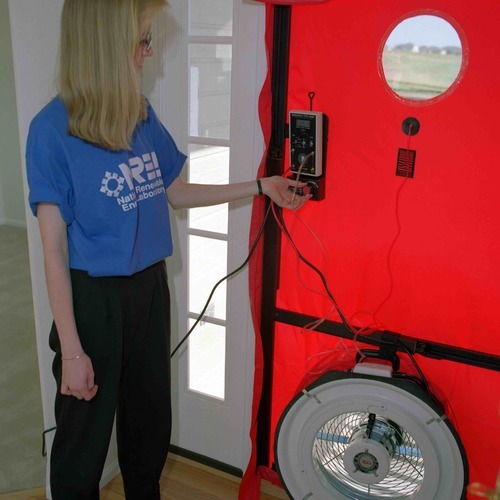 If you are building in a jurisdiction where residential construction must comply with the 2012 IRC, any new home with a blower-door test result of less than 5.0 ach50 must include a whole-house ventilation system. This provision of the 2012 IRC can be found in Chapter 3, section R303.4. This section notes that the ventilation system must comply with requirements listed in 2012 IRC, Chapter 15, section M1507.3. Since the new code requires homes in all zones except zones 1 and 2 to achieve 3 ach50, the code effectively mandates a whole-house mechanical ventilation system for homes in zones 3 through 8. More information on these IRC requirements can be found in the comments posted below on 9/21/2011. Note that the whole-house ventilation system requirements in the 2012 IRC refer to two tables, Table M1507.3.3(1) and Table M1507.3.3(2). These tables are reproduced on this page as Image #7 and Image #8, below. Builders in many climate zones will need to choose windows with a lower U-factor and a lower solar heat-gain coefficient (SHGC). In climate zone 1, the maximum window U-factor changes from U-1.2 to U-0.65, while the maximum SHGC changes from 0.30 to 0.25. In climate zone 2, the maximum window U-factor changes from U-0.65 to U-0.40, while the maximum SHGC changes from 0.30 to 0.25. In climate zone 3, the maximum window U-factor changes from U-0.50 to U-0.35, while the maximum SHGC changes from 0.30 to 0.25. In climate zone 4 (except Marine), window SHGC is regulated for the first time. The maximum permissible SHGC is 0.40. In climate zone 5 and Marine 4, the maximum window U-factor changes from U-0.35 to U-0.32. In climate zone Marine 4 and zones 5, 6, 7, and 8, the maximum window U-factor changes from U-0.35 to U-0.32. There are no restrictions on SHGC in climate zone Marine 4 and zones 5, 6, 7, and 8. In these climates, a high SHGC is usually desirable, especially on the south orientation. Prescriptive requirements for glazing U-factor and glazing SHGC are found in Table 402.1.1 of the 2012 IECC; the table is reproduced on this page as an image (below). 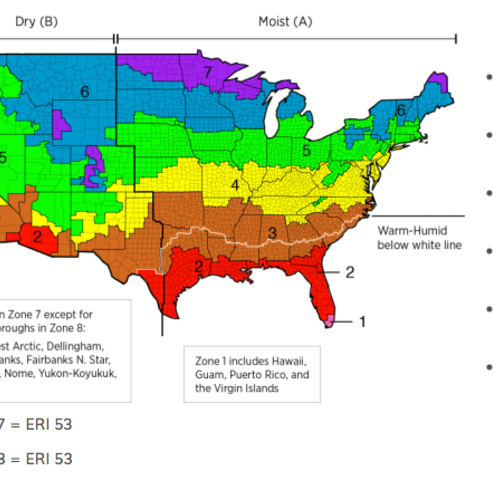 In climate zones 2 and 3, the minimum ceiling R-value has been increased from R-30 to R-38. In climate zones 4 and 5, the minimum ceiling R-value has been increased from R-38 to R-49. In climate zones 3 and 4 (except zone Marine 4), the minimum R-value for above-grade walls has been increased from R-13 to R-20 (or R-13 with an additional layer of R-5 continuous insulation). In climate zone Marine 4 and zone 5, the minimum basement wall and crawl space wall R-value has been increased from R-10 continuous to R-15 continuous. In climate zones 6, 7, and 8, the minimum crawl space wall R-value has been increased from R-10 continuous to R-15 continuous. However, the most earth-shaking changes found in Table 402.1.1 are the wall insulation requirements for climate zones 6, 7, and 8 — an area that includes Wyoming, Montana, North Dakota, South Dakota, Minnesota, Wisconsin, Vermont, New Hampshire, and Maine. In these zones, the 2012 code calls for above-grade walls to have at least “R-20+R-5” insulation or “R-13+R-10” insulation. Most builders in these climate zones will find that the easiest compliance option will be to include R-5 or better foam insulation on the exterior of a 2×6 wall, or R-10 or better foam insulation on the exterior of a 2×4 wall. To meet R-5, builders will need at least 1.5 inch of EPS, 1 inch of XPS, or 3/4 inch of polyisocyanurate. To meet R-10, builders will need at least 3 inches of EPS, 2 inches of XPS, or 1.5 inch of polyiso. Note that all of these code requirements are minimum requirements. In many climates, the minimum code requirement for the R-value of the continuous insulation (usually rigid foam) is not enough to keep OSB or plywood wall sheathing above the dew point in winter. Builders in Vermont who choose to install R-5 foam on a 2×6 wall will eventually discover that their OSB stays damp and begins to mold. For more information on this subject, see The 2012 Code Encourages Risky Wall Strategies. To comply with the R-20 plus R-5 requirement, some of the insulation — at least R-5 worth — must be continuous. That means you need at least 1.5 inch of cellulose between the two rows of studs, implying that a double-stud wall needs to be at least 8.5 inches thick. Since 8.5 inches of cellulose has an R-value of R-31.5, the total R-value of the wall exceeds the R-20 plus R-5 requirement. In conclusion, any double-stud wall that is at least 8.5 inches thick appears to comply with the R-20 plus R-5 requirement. Prescriptive insulation requirements for ceilings, walls, and floors are found in Table 402.1.1 of the 2012 IECC; the table is reproduced on this page as an image (below). The 2012 IECC includes new requirements for R-3 or better pipe insulation on most types of hot-water pipes. A full explanation of the pipe insulation requirements can be found in Improvements to 2012 IECC. The 2012 IECC is a significant improvement over all previous U.S. energy codes. However, energy experts should probably refrain from popping any champagne corks. An improved energy code is all fine and good, but if the code is unenforced, its existence is largely irrelevant. 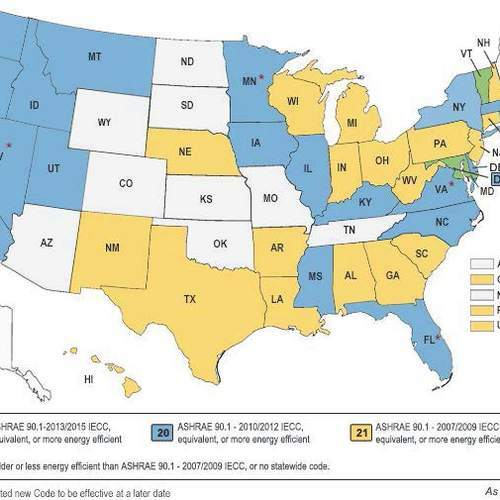 Unfortunately, in most jurisdictions, most provisions of U.S. energy codes have never been enforced. For the 2012 IECC to be meaningful, thousands of local building code officials will need extensive training, and the budgets of thousands of local building departments will need to be substantially increased. Considering the current political climate, however, these essential steps may never be taken. Thanks for the nice overview of the 2012 IECC - I like that the bar is being raised, but I agree that it's all in the enforcement. If we enforced our current energy codes there would be a big improvement in efficiency. Rules are only as good as the people policing them. Here's to hoping that the cops on the beat will be well trained and have incentives to make people play by the rules. I have run a number of calculations, using real-time data, that show clearly that using just 1" of XPS foam (R-5) on the outside of a 2x6 wall in a cold moist climate (like that around the Great Lakes) will cause moisture to condense on the inside of the wall sheeting. It will remain as condensation for months at a time, especially on the north side of the house. The Washington State Energy Code made this same mistake two years ago. They ran all their tests in Western Washington (coastal zone 4), where the winter temperatures are much milder. Of course it worked fine here, but in Eastern Washington (zone 5, a little bit of zone 6) the first condensing surface is inside the fiberglass portion of the wall. History has proven that OSB can be a very good petri dish. The solution for Eastern Washington is to go up to R-7.5 foam. Then the first condensing surface, in all but the most extreme weather, is inside the XPS layer, where there will be no moisture to condense. We really need to get Government out of the business of telling us HOW to build homes. Just give us the energy targets we need to meet, and let industry compete to come up with the best solutions. If you can't run an energy calculation on your proposed building design, you should not be in the business of building houses. I know that is a little hard-assed, but it just isn't simple any more. Regarding the blower door test requirements, i agree that this is a good goal, however I have seen very few homes, other than SIPS or ICF homes, that could meet that goal. Again, we have to get much better, or get out of the business. 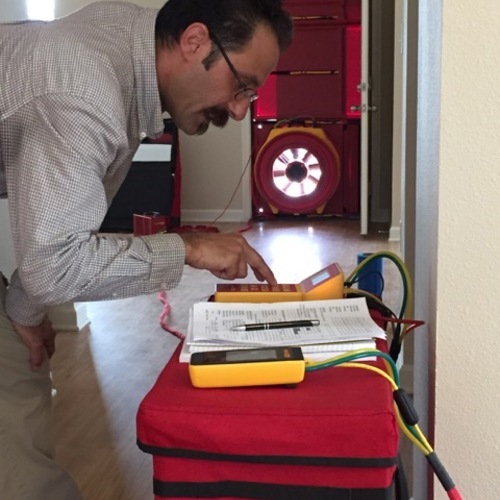 Joe Lstiburek has a recent article that's more or less about blower door testing and how tight is "just right" from a public policy ("code") perspective. http://www.buildingscience.com/documents/insights/bsi-053-just-right-and-airtight/ Back in the '80s, he was helping giant production builders regularly achieve ~3.0ACH50 without too much trouble. It certainly doesn't take SIPS or ICFs. in my experience, it doesn't take much at all. The small production builders I work with are now regularly achieving 2.0-3.0ACH50. The more performance-oriented builders I work with are now regularly achieving ~1.0ACH50...all with 2x construction. Regarding the lack of a ventilation requirement in the code combined with increased air-tightness requirement - that's just stupid. I hope that builders will follow either: a) common sense or b) established building science and install controlled ventilation systems rather than: c) save a buck and say, "code doesn't require it!" The new code is reasonable as far as the energy efficiency standards and 3 ach50 is a good infiltration target. I would guess the average new home constructed in the Twin Cities is somewhere around 2 ach50. We have no mandated infiltration test but the MN code has called for a continuous air barrier for many years. Builders have complied with the code and will find the 2012 IECC quite easy to meet with just some minor wall detail changes and a few other energy upgrades. The standards set in the 2012 IECC will give homes built under the new code a substantial efficiency increase over their business as usual counterparts. Reducing air infiltration in new homes is a very low cost way to make homes more comfortable and energy efficient. I used to argue with Joe Lstiburek on a similar point -- why does the code still allow builders to install interior poly in climates where interior poly can get you into trouble? Joe answered, "The code doesn't tell you how to build a good house. All it does is establish the minimum legal requirements." In other words, don't expect the code to tell you how to build a house. So, if you're a builder, don't look to the exterior foam requirement as a guide. That's the minimum -- not the R-value that will keep you out of trouble. Similarly, don't forget to install a ventilation system! Builders who wait for the code to require a ventilation system before installing one aren't using their brains. Ted, your point about reminding builders to use exterior foam of an adequate thickness to keep the OSB above the dew point in winter is a good one. I'll edit the text of my article to reflect that point. Thanks to both of you for your comments. I did not mean to imply that most builders could not achieve 3.0ACH50, just that they currently do not, and furthermore, that most simply have no understanding of why they should. There is a huge information gap in the building world. I am often accused (rightfully so) of viewing the world through my own glasses (whatever color those may be). Because the light is so bright down here, I fail to see that I am really at the bottom of a very deep, dark hole, and I am all alone down here. Many of you who participate in these discussions are also in holes of your own. We are working like moles, digging and building, building and digging, and doing it very well. We fail to recognize that others are up there on the surface, building and building, with no clue what we are doing down here. We are so enlightened that we fail to recognize the darkness that exists at the surface, in the "real world". A significant part of my time is spent talking to builders about airsealing. I'm now finding that they know the subject is becoming increasingly important for their business but they still don't have any idea of what ACH values that they should target, or how to get there other than a foam can and a caulking tube. And if thats where they start dealing with ACH, then so be it. At least it starts for them. - My vendor SIGA has announced that they are hiring 2 reps for the west coast. Details at: http://www.smallplanetworkshop.com/siga-employment/. These reps will be doing nothing but teaching airsealing to builders. - A group of good smart guys I like have opened another company (and are a competitor to me) in NYC. They have brought in another excellent airsealing line from the top notch german company: Pro-Clima. These guys are at: http://www.foursevenfive.com/ and they will be teaching airsealing in order to build a market. - Earlier in the month I spent a day at the Tremco headquarters in Cleveland OH. They have brought over products and people from a sister company in Germany. The company makes products for airsealing known in Europe as Illbruck Trio expanding foam tape for windows and doors. It will be marketed here in the US by Tremco as Exoair Trio. My company is one of the first in the US to stock it and I can tell you that we will be doing a lot of teaching to the mid-market builders, window manufacturers and dealers. Tremco has put significant resources behind the project and we all hope to make great progress. In order for us to be successful, air sealing will need to become common practice. 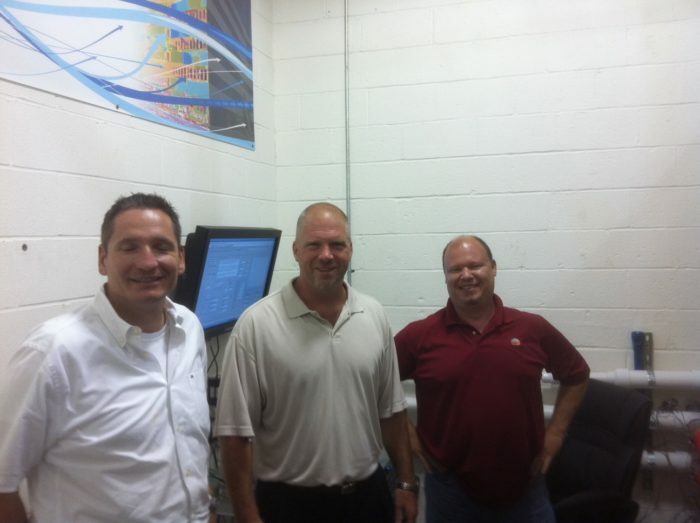 I've attached pics of the lab and testing equipment that has just been completed in Cleveland. We can "call out" a wall for large projects, get it built and tested for both weather and ACH. They've created a program that will compute full envelop ACH based on the performance of a section. In one picture, you can see a full ACH number, but it's not true to the wall section. 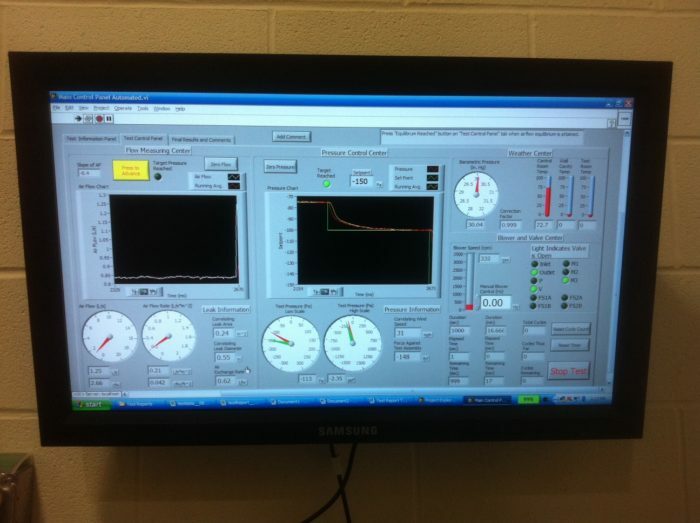 When I took the pic, they had just changed some parameters and it was "charging up" for a new test. The wall section in the picture tested at 0.36ACH 50. It was for a PH project somewhere in NY. The 3 guys in one of the pics are in charge of getting the Trio off the ground. At left is Jeorg who is over here from Illbruck in Germany for 18 months to help get it off the ground. With all of this activity, combined with the other companies working on spray membranes, there is more going on to supply products and knowledge for airsealing. A lot of guys are betting that there is a future in it. Part of the problem is that a lot of goals sound overly complicated. To most people, builders, and even many of us architects, 3 ACH50 doesn't mean anything. If you explain this to a client they will be lost before you start. The system needs to be revised on a scale system to make it simple for everyone to understand these concepts and give them a score on some tangible scale. Another problem is as Ted said, when wrapping a home with rigid or even mixing rigid and fiberglass in the same cavity, you run the risk of condensation between materials. Many installers of spray foam applications understand the minimums but there really needs to be more guidance with wall assemblies and their dew point with a safety for substandard installation. 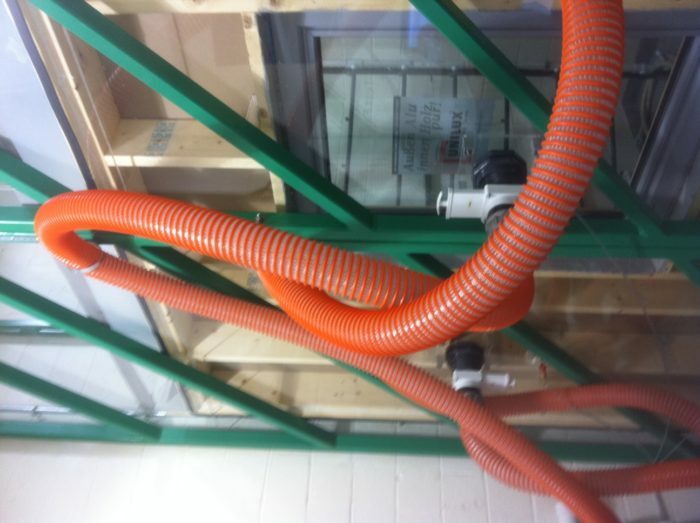 With the new requirements of incorporating continuous insulation in any assembly, clients and builders are trying to get creative to satisfy the requirements in the most cost effective way. We need more guidance on dew point requirements and unusual assembly combinations. This is to not only avoid moisture issues, but also as a tool that building officials can follow to allow these wall assemblies in place of prescriptive energy requirements. For those of you unfamiliar, the Washington State Energy Code, it is already requiring many of the same changes listed in the 2012 Energy Conservation Code such as blower door test requirements, increased insulation requirements, and continuous insulation requirements. When building scientists hear builders or architects complain, "But it's complicated! ", the usual answer is, "There's no substitute for study." If you are an architect who completed four years of college and a graduate degree in architecture, you can figure out the minimum R-value of your foam sheathing. Thank you for this post. A lot of work is being done on the 2012 IECC and it is good to have a reliable source for information on it. However, there are couple of clarifications that might be helpful. 1. I received my new copy of the 2012 IRC a couple of weeks ago. The 2012 IRC doesn't simply reference the IECC; it reprints it word for word. As a result, builders won't have to buy an extra book. 2. The code does address mechanical ventilation although in a roundabout and confusing manner. First, the ventilation requirements are in the 2012 IRC; the 2012 IECC simply sends you to the IRC but doesn't actually tell you where to look. In Chapter 3 of the 2012 IRC, if a house has an air infiltration value of under 5 ACH50 (i think), it sends you to section 1507.3. Section 1507.3 mirrors (imperfectly) ASHRAE 62.2; which means ventilation is required. A couple of caveats, however. This only works if the jurisdiction adopts the IRC as part of the code. Some states like Illinois, only adopt the IECC statewide and this will cause problems. A possible other problem will occur if a state adopts one version of the IECC and a different version of the IRC. If a state adopts the 2012 IECC but still enforces an earlier version of the IRC, a problem will arise because the mechanical ventilation requirements only exist in the 2012 IECC. There are, alas, bugs that need to be worked out. Finally, the 2012 IECC, in climate zones3 and 4, the above grade wall requirements have been bumped up to either R-20 or R13+5. For most builders on this site, that's a minor change. However, for many builders, it represents a big step. It is also important because the majority of construction in the country are in these two climate zones. Thanks for providing the useful and important corrections. I have corrected my article in light of the information you provided. Mechanical ventilation. Where the air infiltration rate of a dwelling unit is less than 5 air changes per hour when tested with a blower door at a pressure of 0.2 inch w.c (50 Pa) in accordance with Section N1102.4.1.2, the dwelling unit shall be provided with whole-house mechanical ventilation in accordance with Section M1507.3. Whole-house mechanical ventilation system. Whole-house mechanical ventilation systems shall be designed in accordance with Sections M1507.3.1 through M1507.3.3. M1507.3.1 System design. The whole-house ventilation system shall consist of one or more supply or exhaust fans, or a combination of such, and associated ducts and controls. Local exhaust or supply fans are permitted to serve as such a system. Outdoor air ducts connected to the return side of an air handler shall be considered to provide supply ventilation. M1507.3.2 System controls. The whole-house mechanical ventilation system shall be provided with controls that enable manual override. I don't think Nicholaus was referring to the possible sub-standard installation of the fiberglass insulation inside the rigid foam insulation, but to the possible sub-standard installation of a spray-foam layer as an air-seal (flash and batt system) in the stud cavity. Nevertheless, it begs comment on the fact that sub-standard installation of fiberglass batts inside the rigid foam insulation could actually improve the vapor profile of the wall, even though it would hurt the thermal effectiveness of the wall. How could this be? If the thermal effectiveness of the fiberglass portion of the wall insulation is lower, the dew-point will be moved farther towards the outside of the wall cavity. If it moves far enough that the dew-point is in the rigid foam layer, the moisture issue goes away, because the cavity layer will always be warm enough to keep any moisture from condensing. Likewise, if you have a perfect fiberglass insulation job, inside of a sub-standard flash and batt spray-foam job, your first condensing surface is more likely to also be somewhere inside the fiberglass layer, because the dew-point will be moved back towards the inside. I agree with Martin, it may be back to school for a lot of Architects, designers, builders, insulation contractors, HVAC contractors, etc., etc.! I was reading your Sept 16 article “Musing of an Energy Nerd,” and I had a couple of quick comments. Just prior to publishing the 2012 IECC and the 2012 IRC, the International Code Council decided to add all the residential provisions of the IECC back into Chapter 11 of the IRC. This happened after the earlier decision at the code hearings to move all of the energy provisions out of Chapter 11. I do not know many of the details of this move, except to say that at this time the 2012 International Residential Code has approximately twenty-eight pages of energy provisions in Chapter 11 that are pretty much duplicated from the residential energy provisions of the IECC. Also, in the previous 2009 IECC, Chapters 1, 2 and 3 applied to both residential and commercial, with Chapter 4 being all residential and Chapter 5 being all commercial. This has changed in the 2012 IECC, where now they have a split-format that contains Chapters 1, 2, 3, & 4 for Commercial construction, followed by Chapters 1, 2, 3 and 4 for Residential Construction. Thanks for your clarifications and corrections. Your explanation about the last-minute changes explains why several sources told me that the 2012 IRC no longer included any energy provisions, but simply referenced the 2012 IECC. I have corrected the text of my article to reflect the information you provided. Your comments about the added EPS insulation still not keeping the OSB above the dew point it very good. The other delema is if you you put a rainscreen or curtain wall behind the foam as is required in some areas the insulation value is disallowed. We seem to try for a "ones size" fits all regualtion and end up with a hoj-poj of regulations that do not address the overall situation. The existing regulations offer you the option of lower energy bills with a damp wall problem or higher energy with a rainscreen system. What's a guy to do? You wrote, "If you you put a rainscreen or curtain wall behind the foam as is required in some areas the insulation value is disallowed." I have never heard of any designer, builder, or building official foolish enough to put the rainscreen gap between the foam and the wall sheathing. In all cases, the rainscreen gap goes between the foam and the siding, so there is no reason for the insulation value to be "disallowed." This new requirement presents a problem when doing sealed insulated crawlspace, •“Where provided in lieu of floor insulation, insulation shall be permanently attached to the crawlspace walls". I am a big proponet of sealed insulated crawlspaces having done my first one in 2005 on my own house using exterior foam and found the performance and naturally heated floors a plus. The obstacle I found was in trying to insulate the foundation walls in such a way that termites could not build hidden tunnels (the house was in a cold dry climate where termites were of little concern). The solution I finally came up with was to use batt insulation inside (as opposed to foam on either the inside or outside). The North American Insulation Manufactuers Association publishes recommenations for installation in frame construction that addresses how to insulate crawl space walls by fastening it at the top (sill plate or top of the band), bringing it down and extending it out 2' over the ground (you need to fasten the batts together so there are no gaps between them). To hold it against the wall you place rock or bricks at the turn at the bottom to hold it down. This gave you the ability to go into the crawl space annually, lift the brick and easily inspect behind the batts to check for termite tunnels. By permanently fastening it you could not do that unless your code official considered the attachment at the top to be the permanent fastening. I have spent quite a bit of time trying to come up with a way to fully insulate a crawl space and not create a hidden place for the tunnels (other than a break in the insulation). If any readers have any ideas on how else to achieve it--please post your suggestions. the author's comment that "The code makes no mention of double-stud walls, so builders who choose this method of construction will need to convince their local building official that a double-stud wall complies with the code. Here’s one way to make the argument" perpetuates a common misconception about the IECC. Continuous insulation is NOT an absolute requirement. Per code, one can easily use a double stud arrangement. Use Section R402.1.3: show that the U-factor for the double stud is equal or less than the frame wall U-factor for your climate zone. OR you can use Section R402.1.4 and do an overall UA calc. Your code officials may try to convince you that only Table R402.1.1 applies. After years of knowing that R-(insert value here) in the cavity complies & everything else fails, everyone needs to adjust to new reality that U-factors, not just straight-up R-values, may be used. Double stud walls can comply even in climate zones 7 & 8.
interesting, but can one use lower nominal insulation? My numbers say that R20 in a 2x6 wall with a 25% framing factor gives you an effective Rvalue of 12: total wall insulation value (inc R5) is R17. Will one be able to talk the officials into allowing a 2x4 PERSIST wall with 3" of polyiso or will they insist on 4"? There is no single answer to your question. The answer depends on the knowledge and flexibility of your local inspector. You can always choose the performance path instead of the prescriptive path -- although that option will require you to hire an energy rater to run some software.